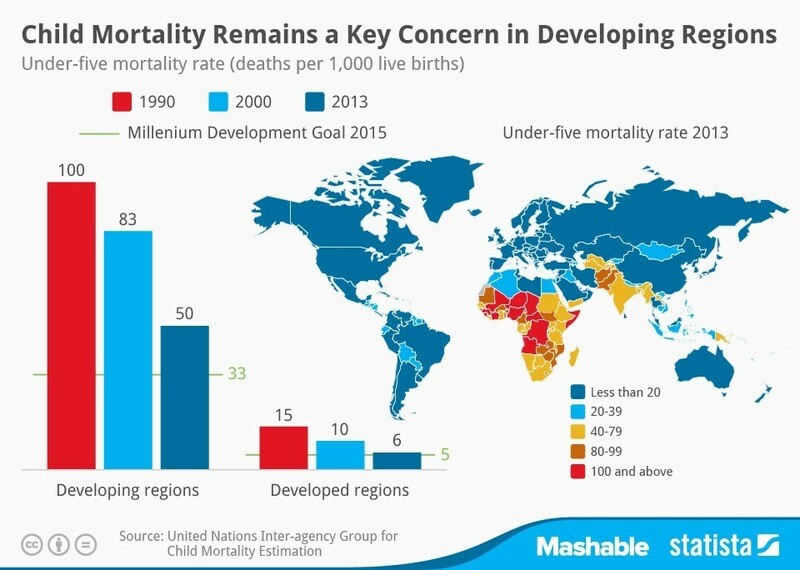 Scooper - Technology News: What will it take to end preventable child deaths? What will it take to end preventable child deaths? Buried among the 169 targets contained in the Sustainable Development Goals (SDGs) – adopted by the United Nations last September amid a blaze of glitzy events, celebrity endorsements, and back-slapping by world leaders, aid donors, and non-governmental organizations – was the vital pledge to eliminate “ preventable child deaths ” by 2030. It is a cause for our generation – but one that will take a lot more than UN communiqués to advance. The last set of international development targets, the Millennium Development Goals, certainly brought about important progress; the number of children who died before reaching their fifth birthday dropped from ten million in 2000, when the MDGs were adopted, to 5.9 million in 2015. Some of the world’s poorest countries have registered some of the most significant gains. This progress was driven by several factors, including falling poverty and heavy investment in community-based health systems. By deploying nurses, midwives, and other health workers, these systems extended the availability of prenatal care, simple obstetric interventions, clean cord cutting, and post-natal care. Ethiopia, for example, has deployed a small army of some 38,000 health workers over the last decade. International cooperation was also crucial. Aid for child and maternal health has grown dramatically since 2000, and now stands at some $12 billion annually. Development assistance has enabled the creation of community-based health programs, and played a key role in supporting the development and deployment of the vaccines, mosquito nets, and medical treatments that have cut child deaths from the major killer infectious diseases – pneumonia, diarrhea, malaria, and measles – by some 70% since 2000. Now for the bad news. In the time it takes you to read this article, more than 30 children will die from causes that could have been prevented or treated. Every year, more than one million children die the day they are born, and another million die within their first week of life. Almost half of all child deaths occur in the neo-natal period (the first 28 days) – and the share is rising. The vast majority of these deaths could be averted. Yet, if progress continues at its current rate, there will still be some 3.6 million such deaths per year by 2030. To jump-start progress, we must develop health-care and other interventions that address the poverty, vulnerability, and inequality that place so many children, and their mothers, at risk. Making health services more widely available is a starting point. But, all too often, the poor are excluded, even when the clinics exist. Consider India, which accounts for one-fifth of child deaths worldwide. Nearly all women from the richest 20% of households enjoy prenatal care and skilled attendants at delivery; coverage rates for the poorest are less than 10% – worse than in much of sub-Saharan Africa. Surging economic growth has done nothing to reduce the disparity. And India is just one example. Each year, some 36 million women in low- and middle-income countries give birth without a skilled attendant . An even greater number of children do not receive a post-natal health check. The vast majority of these women and children have one thing in common: they are poor. Indeed, being born to a low-income mother raises the risk of child mortality by a factor of 2-3 in much of South Asia and sub-Saharan Africa. Wealth-based disparities in health outcomes extend far beyond pregnancy and birth. Children born to poor mothers are less likely to be immunized or taken to clinics for treatment of potentially fatal diseases, such as pneumonia and diarrhea. Survey evidence points to cost as a major barrier excluding poor women and children from health care. Forcing desperately poor women to pay for maternal and child health care is a prescription for inequality, inefficiency, and child deaths. Publicly financed universal health coverage is the proven antidote. Yet political elites in high-mortality countries like India, Pakistan, and Nigeria – the same elites who have signed up to the SDGs – have conspicuously failed to deliver. If governments are sincere about delivering on the SDGs’ promise on child mortality, they must get serious about ensuring equity in health care. They could start by introducing national targets to halve the difference in death rates between the richest 20% and poorest 20% over the next seven years. But targets not backed by finance aren’t worth the communiqué paper they’re printed on. Developing-country governments should be spending at least 5% of GDP on health , eliminating charges on child and maternal health care, and ensuring that financial resources – and health workers – are allocated in a way that reduces inequalities in care. Foreign aid also has a vital role to play. Here, the emphasis should be shifted from delivering disease-specific interventions to building up health-care systems. We need a global social compact on health to close the financing gap – around $30 billion – for achieving universal health coverage, which requires linking populations to skilled health workers equipped to provide effective care. Sub-Saharan Africa alone will need to recruit and train another one million community health workers to deliver universal coverage . Any strategy for achieving the 2030 target for child mortality must go beyond the health sector and focus on the wider inequalities – for example, in nutrition, education, and access to clean water and sanitation – that fuel child mortality. Girls will need added protection, so that they are not forced into early marriage and child bearing. Children worldwide face a lethal combination of inequality, injustice, and gender discrimination. They deserve better. The promise to eliminate preventable child deaths by 2030 is our chance to ensure they get it.